Ice Nine Kills have dropped the video for “Stabbing in the Dark” from their new album The Silver Scream. Watch it here. “He’s been in everything from horror to Seinfeld to Back to The Future, so I knew he would be able to capture the essence of terror but with an underlying tongue-in-cheek spirit,” he furthered. “The amazing people at Haunted Overload horror park in Lee, New Hampshire lent their amazing resources to us to make this the most visually stunning episode so far,” the singer finished. The Silver Scream arrived on Friday, October 5 via Fearless Records. All of the album’s 13 anthems are based on 13 respective horror classics. The record absolutely exploded onto the charts, moving nearly 19,000 units. The various chart positions, many of which are career high water marks for the band, are below. 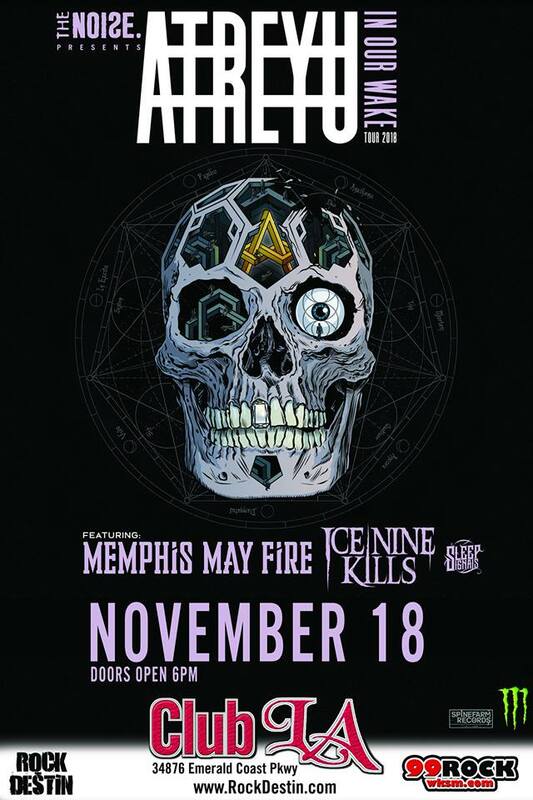 The band will hit the road with Atreyu and Memphis May Fire next month. Those dates are posted below. The band and Heavy Consequence also teamed up to premiere the chilling, The Crow-inspired video for “A Grave Mistake.” Watch it here. INK previously issued the video for “Thank God It’s Friday.” In the clip, the group (and a bunch of unsuspecting teenagers) visit Crystal Lake and that’s when all the trouble ensues. The video is a modern tribute to the classic Friday the 13th slasher series starring machete-wielding horror hero Jason Voorhees. Watch it here. The band also shared the equally cinematic video for “The American Nightmare” — a twisted and tasteful homage to director Wes Craven’s A Nightmare on Elm Street franchise. The video provides a thematic feast for children of the ’80s who grew up loving Freddie Krueger, the first film, and its sequels. It was directed by Daniel Hourihan and is the first installment of an over-arching film that will be a counterpart to the The Silver Scream. Watch it here. This entry was posted on November 13, 2018 by 850music in Posts and tagged press release.